Description This listing is for an antique vest from the early 1900s. 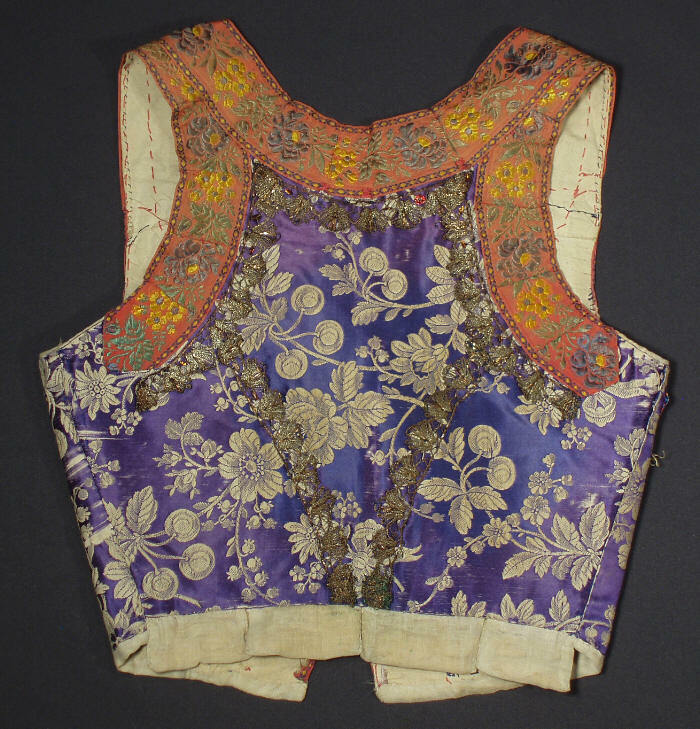 The vest is made from stunning purple silk brocade and trimmed with floral ribbon and metal lace. 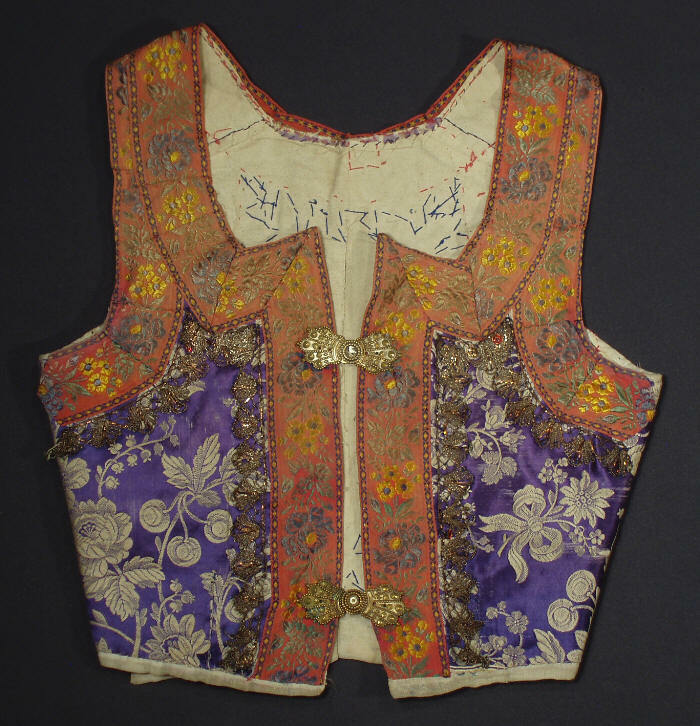 The vest is part of a traditional folk costume from western Slovakia. The vest comes with two of the original metal clasps on the front. A fine addition to your antique ethnic costume collection. Please visit our seller's list to see other international books about world travel and art as well as ethnic costumes from other European, African and Asian countries. We are happy to combine multiple purchases and save you shipping fees! Please e-mail us with any questions and we will be more than happy to help. Although this might have been worn well up and into the early 1900's, the style suggests a Regency era bodice. The tabs on the back of the bodice were popular in the late 18th/early 19th C. The materials also look 18th C.
While you are right that the short style looks Regency and may originate in the time, I'm not sure you can apply the term to a regional folk costume / ethnic dress... very often, the styles were a bit "behind the times", so in the era of Regency an older type of bodice may have actually been worn... if you see what I'm getting at. I do understand. However, in this case, I was looking at the fabric itself which is more 18th century in style. I also looked at the tabs which you don't see on the later regional styles. I've examined some of the regional styles - mostly Italian and French- from the later periods and they don't quite match. 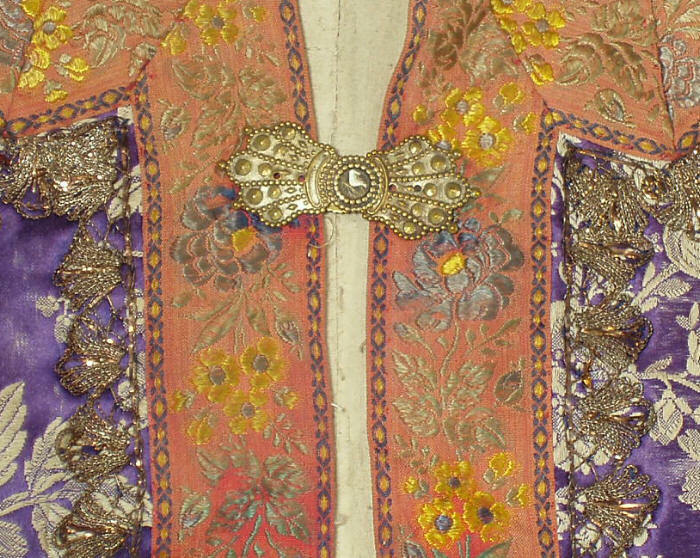 Now, because many of these more "fancy" items were passed down and two or three generations might wear the same object with only a few changes, it could have been worn at a later date. Actually, I think if anything approaching that, the fabric is really more of an "early 1900s do 18th century style". That purple dye looks suspiciously synthetic for 18th century to me, and I think the brocaded pattern also isn't quite right. It's hard to say what exactly is the matter - it's a combination of elements, the intricate all-over nature of the pattern combined with the fact it's only two colours, mostly. The trouble is, you really can't say that because in one area of Europe, folk costumes proceeded a certain way, they did so everywhere in Europe, or, indeed, everywhere in the same country. Whew, it could be completely different in the neighbouring village! I know you are trying very hard to be helpful but this simply really is 18th century fabric. Here is a very similar pattern and color to the bodice above. 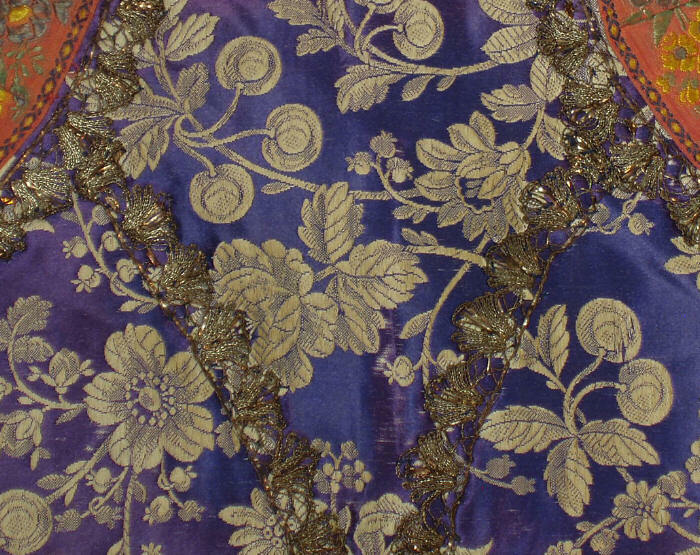 18th century purples do tend to stay pretty vibrant.